Among the many new museum collections we are continually adding to our digital image archive, the Albright-Knox Art Gallery of Buffalo, NY is one of my favorites. What a wonderful collection of contemporary art this museum has! By far one of the neatest artists I’ve ever studied is Jackie Winsor. I love any sculptor who emphasizes the beauty of the material worked and uses the material’s properties to accentuate the form. I am a big fan of all of Winsor’s cube sculptures, especially her Burned Piece, but I find myself rapidly falling in love with this gem from the Albright-Knox. If it doesn’t sum up the aesthetics of Minimalism, and yet display aspects of Process Art, nothing does! In the 1960s and 1970s, Minimalism, Process Art, and Pop Art countered the subjective tendencies of Abstract Expressionism. Abstract Expressionism, which held sway in the American art world from the 1940s to the 1960s, emphasized the truthfulness to the medium, primarily painting: an idea prevalent in art since the time of the Impressionists. The movement also emphasized a rejection of lyrical, narrative, or historical connotations in a work of art. Minimalism emphasized the process and psychology behind a work of art. In the work of Jacqueline Winsor we see a sophisticated implementation of the minimalist aesthetic much like the work of Sol LeWitt. Like many minimalist sculptors, Winsor’s works are meant to be incorporated into the viewer’s space. Jacqueline Winsor is the descendant of three hundred years of Canadian ship captains. She moved to Boston during her adolescence. She studied at Yale Summer School for the Arts, the Massachusetts School of Art in Boston, and eventually earned an MFA from Rutgers University. She emerged in the 1960s along with Bruce Nauman and Eva Hesse, anti-minimalists whose work was also called "anti-art" or "eccentric abstraction.” A member of the post-Minimalist generation, Winsor inherits the Minimalists' preference for simple geometric shapes, though her works are handmade, and their surfaces are more various and tactile than Minimalism's impersonal, machine-honed planes. Winsor’s early works included many dense coils of rope; saplings bound by rope; and many works that involved the twining, wrapping, and layering process. In the early 1970s she became aware of sculptor Richard Serra’s emphasis on material, weight, and space. In 1974 she began a number of works based on the cube which have become the hallmark of much of her oeuvre. The cube is a rational and non-referential form that was emblematic of the minimalist aesthetic. In 55 x 55 the pine strips are arranged vertically. The 28 vertical sticks are separated horizontally by small one-inch sections of pine creating three “floors,” trisecting the cube into four sub-sections. 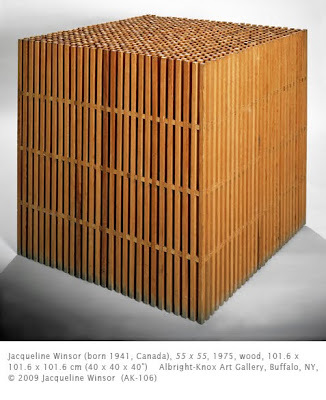 The title of this work was derived from the sum of 28 areas of wood (positive space) and the alternating 27 areas of air (negative space) which are of equal importance to Winsor.